No one is sure of the origins of the name "Galion" but everyone seems to agree that it wasn't the first choice. Most of the early names suggested were rejected by the postal service because they conflicted with other Ohio communities. Whatever the source, the name Galion became official in 1831 when the town was laid out with 35 plots by Michael and Jacob Ruhl. The town grew slowly over the next half century until 1900 when the Big Four Depot became the division headquarters for the Cleveland, Chicago, Cincinnati and St. Louis Railroad. Galion became a railroad town and in time a 2nd depot was built to handle the rail traffic. A number of 20th Century presidential politicians stopped in Galion to convince the citizens they deserved their vote. 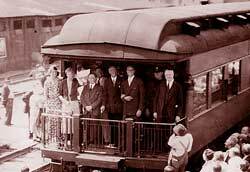 In 1932 Franklin Roosevelt stopped in town long enough to give a speech from the back of the train at the Big Four Depot and returned again in 1936. After the war, Dwight Eisenhower and Richard Nixon stopped in town in 1952. The Depot was dedication in 1900. After World War I, 32 trains stopped at this station daily. 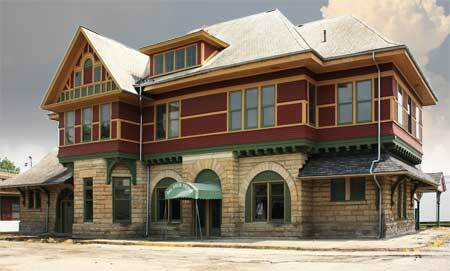 The depot remain a popular spot until 1929 when the New York Central acquired the Big Four and moved the division headquarters to Bellefontaine. The ticket office remained opened until 1964 but in 1969 all of the railroad offices were closed. The Depot was listed on the National Register of Historic Places in 1974. Currently, plans are being developed to restore the historic depot. The home of Episcopal Bishop William Scranton Brown, was built in 1887 by Bishop Brown's future mother-in-law, Mary Bradford, as a wedding gift for Bishop Brown and her adopted niece Ella, at a cost of $6,500. What makes this property unique is the original owner, Bishop Brown, was known across the country as an avowed communist. and even though he was an Bishop in the church, he didn't believe in Jesus. In the back of the cottage are covered and enclosed walkways that are close to 100 feet in length. These were added in the 1920s so Bishop Brown could walk no matter what the weather. Although the building appears to be made of brick, most of it is actually a brick veneer attached to the walls with iron bolts in the shape of Maltese crosses. Another building on the site was used as Galion's Catholic Church. With the construction of the cottage, the brick building was converted to the Bishop's study. The name Brownella was derived from combining the names of Brown and and his wife Ella. In 1911 Brown suffered a nervous breakdown and spent the next several years recuperating at Brownella. It was during this period of recuperation that Brown began to read the works of Karl Marx and Charles Darwin. Over the next 8 years Brown converted to Marxism, and rejected the official doctrine of the church. In 1924 Brown became the only Bishop to have been convicted of heresy since the Middle Ages. Ella died in 1935 and 2 years later, on halloween, Brown died in the house. After the Bishop's death, the cottage stood empty for 40 years. In 1979 it was given a $250,000 restoration and then given to the Galion Historical Society and now serves as their headquarters/museum. 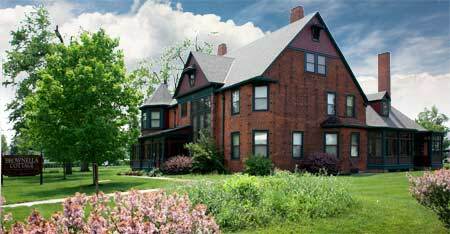 The cottage is open to the public on Sundays, June through October with guided tours beginning at 1:30, 2:15 and 3:00 p.m. at a cost of $5.00 per person. The Log Cabin now located in Heise Park in Galion was used as the original Galion Library and reading room when the library was first established in 1901. 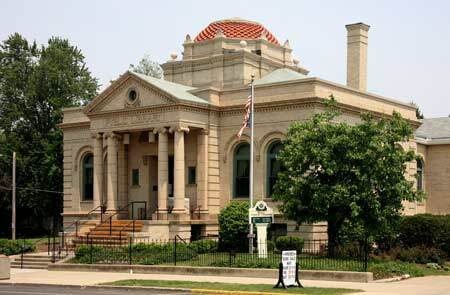 The new library shown below was built in 1904 through a grant from Andrew Carnegie. The original "reading room" was located behind the new library and after completion of the new building, the structure once again was used as a residence. In 1966 the Galion Historical Society took over the structure and remained there until 1984. When construction workers began an expansion of the library it was decided to tear down the structure, but when the wooden clapboard siding was removed, workers discovered the building was actually an original log house that was over 150 years old. Experts believed the house was built sometime in the 1820s. Wanting to preserve the structure, it was completely dismantled and reassembled in its current location.